A little colour does go a long way, from a light day make-up, adding just a little more colour and careful blending will take you from office to a night out. The much sort after smoky eye effect does take on a glam look, but so does a little practice. Taking into consideration that every eye shape differs and blending to the desired satisfaction may be a little tricky, it does help that there are tools out there to assist. 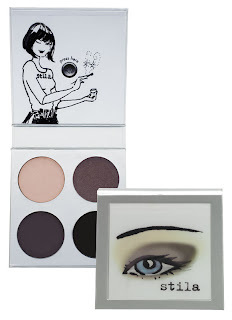 Cargo Cosmetics Smoky Eye Kit comes with an Eyeliner Duo, Mascara and their innovative SmokyEye Brush, all the essentials you’ll need to create the glamorous smoky eye look and at US$39 it’s a steal. If you need to be talked through the steps then Stila’s talking palette will be the best bet, the palette comes in four shades and with the push of a button, a tutorial guides you step by step to achieve the smoky eye look. Its popularity is so immense than stock has run out but you can email your orders to Stila Cosmetics. Hmmm this is so interesting! I always look up "how to do smoky eyes" on youtube! Yeah, never thought of youtube, got to check it out. 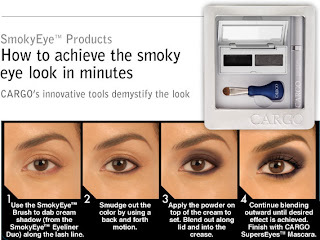 I'm intrigued by the Cargo Smoky Eye Brush.